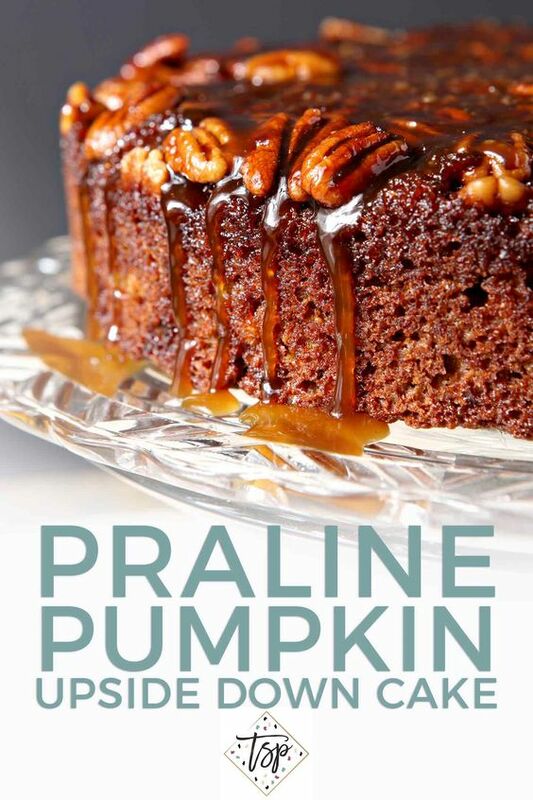 Combine two favorite fall flavors to make the ULTIMATE Thanksgiving dessert: Praline Pumpkin Upside Down Cake! 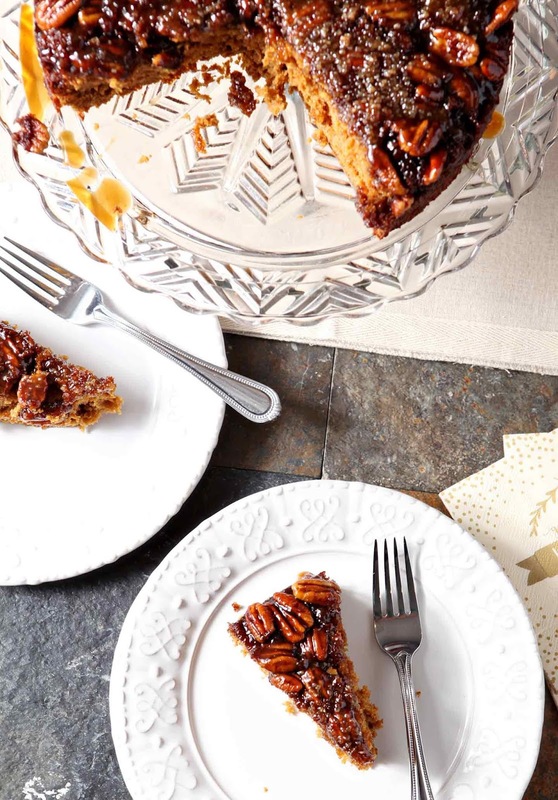 Bourbon pralines create the base/top of this cake, then pecans add decoration. Once the pecans are in place, pour the thick pumpkin cake batter into the cake pan, and bake! Flip after removing from the oven and free from the pan, then drizzle with bourbon caramel sauce for the finishing touch. This cake is decadently moist and perfect! Heat a 9" round cake pan over medium-heat on the stovetop. Melt the butter, and when the butter is melted, add the brown sugar. When the brown sugar begins to bubble, add the bourbon. Stir constantly until the bourbon has cooked off, then remove from the heat. In a large glass bowl, melt the butter in the microwave. When the butter is melted, add the pumpkin to the mixture with the sugar. Whisk together until smooth and combined. In another glass bowl, sift together the flour, baking powder, baking soda, salt, cinnamon, ginger and allspice. Slowly add the dry ingredients to the wet ingredients, stirring until smooth and combined. Do not overmix. The batter will be thick, so use a rubber spatula or a wooden spoon to mix at this point. When the batter has come together, pour onto the prepared topping in the cake pan. Smooth out the batter until it's evenly distributed in the pan. Place in the oven, and bake for 40-45 minutes, or until an inserted toothpick comes out clean. The cake will be a dark golden brown color. Run a knife along the edges of the cake. Place a heatproof cake plate on top, and carefully flip the cake to remove it from the pan. Some of the pecans may have gone astray, so you can rearrange them here. In a small skillet over medium-high heat, melt the butter. Add the brown sugar, stirring as it heats, then pour in the bourbon. The mixture will bubble and pop, so continue stirring and remove from the heat. Immediately drizzle on top of the cake, and enjoy! This will make a 9" round cake. The serving size, as listed here, is 8 slices, but it could obviously feed more! 0 Response to "Praline Pumpkin Upside Down Cake"